Flowers are white and tubular with four lobes at each axil along the stem. Natural Habitat: A spreading perennial weed with opposite leaves that often have a yellowish mottling due to the presence of a virus that grows in close association with this weed. Virginia buttonweed seems to proliferate in moist or wet areas, tolerates close mowing and is a very troublesome weed of lawns and turfgrass and is found from New Jersey west to Missouri and south into the Gulf Coast states. Identification: Spreading perennial herb / weed with hairy, branched stems. 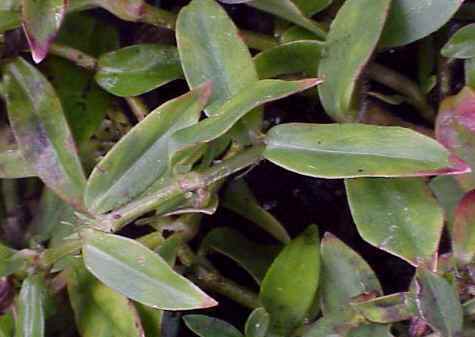 Leaves: Opposite, elliptic to lance-shaped, without petioles (sessile), and approximately 1 to 2 inches long by to 1 inch wide. Foliage: Leaves often have a yellow mottling due to the presence of a virus and the leaves are joined across the stem by a membrane that has 1 to 3 stipules that resemble long bristly hairs. 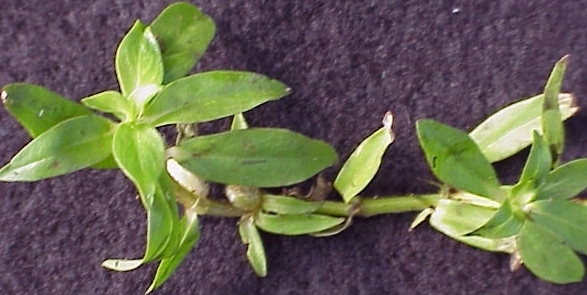 Flowers: Occur in the position between the leaf and the stem (leaf axils). 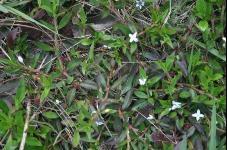 Individual flowers are star-shaped with four white petals and are approximately 3 inches wide and ¾ inch long. Fruit: A small, hairy capsule that contains 2 seeds. Roots: Flesh roots allow vegetative reproduction to occur. Seedling: Cotyledons are thick and oblong, dark green on the upper surface and lighter green below. First true leaves are elliptic to lance-shaped, without petioles (sessile), and are joined across the stem by a membrane that has 1 to 3 stipules that resemble long bristly hairs.